Continuing our string of books-to-movies this week is This is Where I Leave You, based on the novel by Jonathan Tropper, who also wrote the movie's screenplay. I have not read the book, but I was hoping that, based on its cast alone, the movie would be a mix of funny and serious elements - a dramedy, perhaps. Unfortunately, the film could have been funnier, and I wasn't that impressed with it overall. Judd Altman (Jason Bateman) is having a rough year. He discovered his wife, Quinn (Abigail Spencer), cheating on him with his boss, radio personality Wade Beaufort (Dax Shepard), and he moves out of their beautiful loft into a small bachelor-esque apartment. His sister, Wendy (Tina Fey), then calls him to say that his father has passed away, so he leaves NYC to head back home to sit shiva with his mom (Jane Fonda) and his other two brothers, Phillip (Adam Driver) and Paul (Corey Stoll). While back home, he reconnects with an old crush, Penny (Rose Byrne), which throws a wrench into things, especially after he learns that (semi-spoiler) his estranged wife is pregnant with his child. Judd also must reconnect with his siblings, none of which he's especially close with, as they sit shiva for seven days to mourn his father's passing. The cast in this movie includes so many A-listers, which is why I was surprised the movie wasn't better. Tina Fey, Jason Bateman, Jane Fonda, and Adam Driver comprise 4/5ths of the dysfunctional Altman family. Dax Shepard also has a funny part as the man who Bateman's wife is sleeping with, and Timothy Olyphant as a shy loner who Fey's character used to go out with, and who now has a brain injury; in fact, I would have liked to have seen that relationship explored more, but it's only touched upon (she used to, and still, loves him). Maybe see this movie. I'd like to give it a Yes review - and perhaps I'm just jaded and/or tired of seeing films this week, since this was my third screening of the week - but it wasn't as good as I thought it would be. The funniest parts in it are actually when Fey's son, a toddler, takes his portable potty outside to do his business, and he frequently does this throughout the movie. Fey, unfortunately, who is usually great at comedy (any 30 Rock fans here? ), is drastically underused. I did like the ending of the film, and the acting was overall fine, but I feel that it could have been better, especially with the quality of actors involved in the project. If you still feel the need to see it, I'd definitely save it for a matinee, or maybe even to see as a rental when it's out on Blu-ray/DVD. 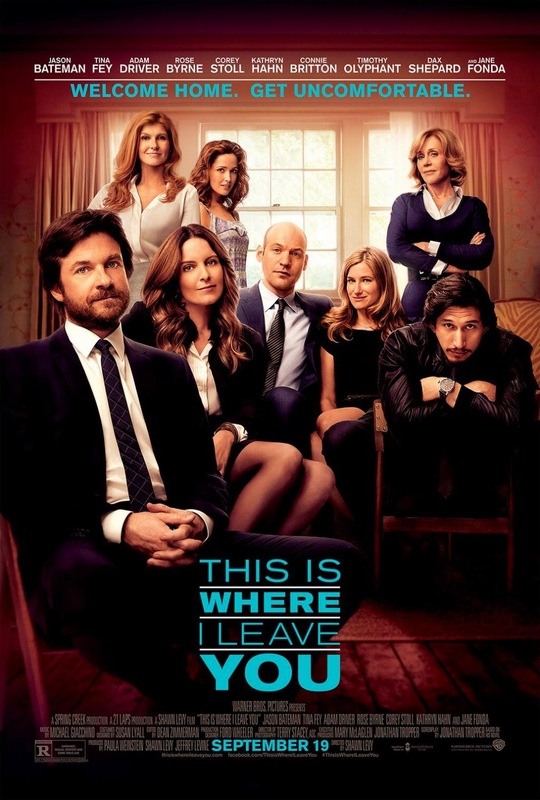 This is Where I Leave You is in theaters today, September 19th, and is rated R with a runtime of 103 minutes. 3 stars out of 5. Sounds like a good plot and cast...was it a bad script, lack of directing or just no good charma that kept this movie from being good? I think bad script and slow at times. It was just OKAY (wasn't all bad) but I thought it would've been better. The plot does sound interesting, but it is too bad that Tina Fey was under utilized. On a side note, I didn't know shiva could last 7 days. Sounds like it could have been a good movie..too bad it didn't live up to expectations.